Sometimes it means a simple re-organisation of a room, but often it means a more involved re-design of their home. We aim to maximise the space that they already have by changing the layout of the rooms, introducing flexible multi use spaces and designing discreet built in furniture. It is so rewarding for us and the client when we can transform the existing space into one that works efficiently and effortlessly with their lifestyle. And then we all get to choose paint colours, new sofas and pot plants together - the final touches to create a home that they’re proud to share with their family and friends. We've been working on some new furniture pieces recently and have been looking back at some of our previous ones. This is still one of our favourites. Made to specific dimensions for a family living room and beautifully crafted in white and oak with those lovely yellow legs, we're particularly happy with it. And very tempted to sneak some hairpins into a future project. Time for some finished photos of this lovely project in Farnham, Surrey. Built in to the end wall of a modern extension to this family home, the furniture has created much needed storage and visual interest in the open living space. 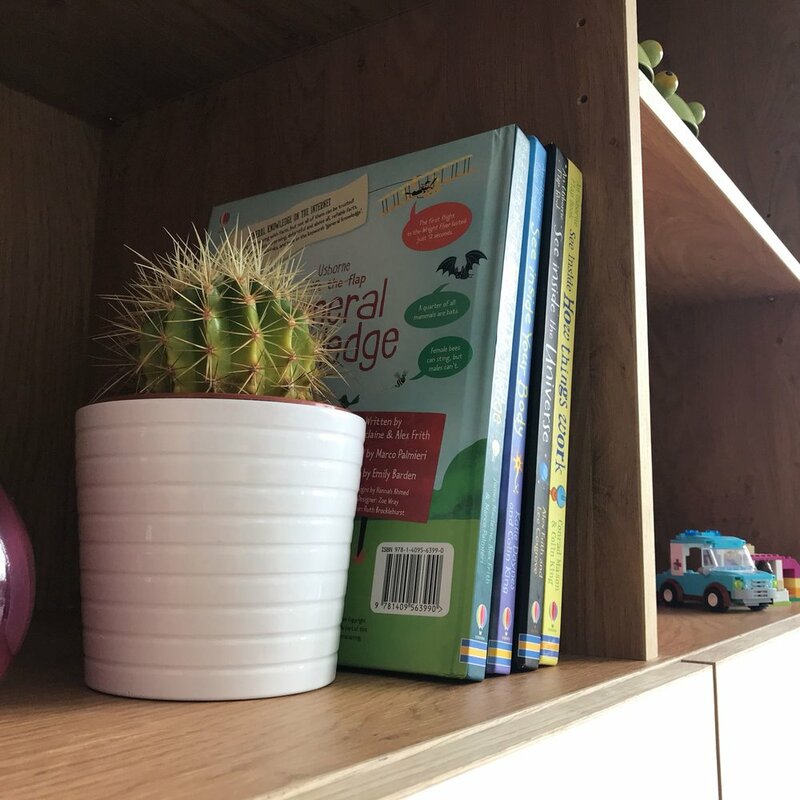 With the oak shelves adding warmth to the white doors, it is a perfect backdrop for books and treasured toys. Nelson Taylor have had busy weekends recently. On Saturday we installed living room furniture at two homes in Farnham. With different briefs and two very different styles, we made the most of the bespoke nature of our cabinets to ensure that each client received exactly what they wanted for their living spaces. 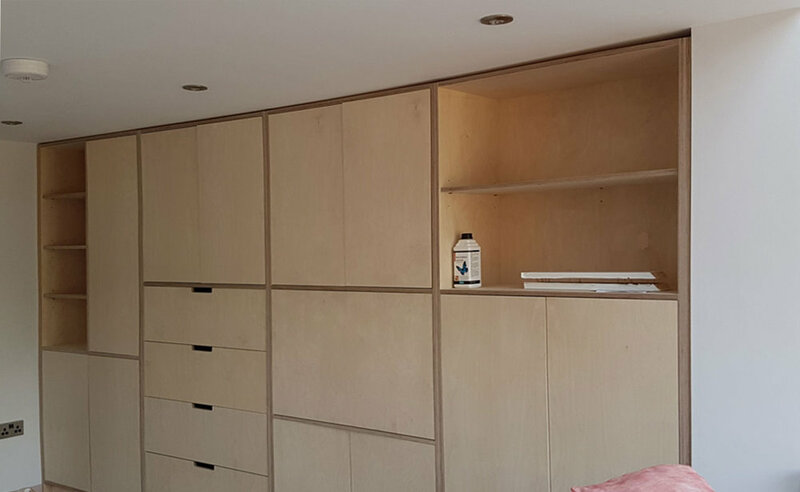 First up were some plywood cabinets that maximise a wall in the family's open plan extension, to create plenty of storage and a fold down desk for homework. Crafted in plywood, to create lovely visual interest to the cabinets, the doors will be oiled by hand in situ to bring out the beauty of the plywood grain. Check back into our blog soon for the finished photos. Next were some white and oak cabinets in this family's modern living space. With a boiler hidden away to the right hand side, they then had the opportunity to have some open shelves on the rest of the wall. With the touches of oak warming up the wall of white doors, we created plenty of storage whilst keeping it feeling homely. Already over the moon with the storage potential we're sure they will be super happy with the finished furniture....more photos to follow soon once the television is fitted. We're very excited about this kitchen. The clients are both architects, who are building a beautifully crafted new home for their family. The design and detailing throughout the house is exquisite and we have worked closely with them to ensure that this continues into the kitchen. The choice of materials, the careful consideration of how they sit within the open plan space and the elegant oversized proportions of the cabinets all help to create a very modern kitchen. We can't wait to see it become the centre of this stunning family home. Check back on our blog soon for some finished photos.